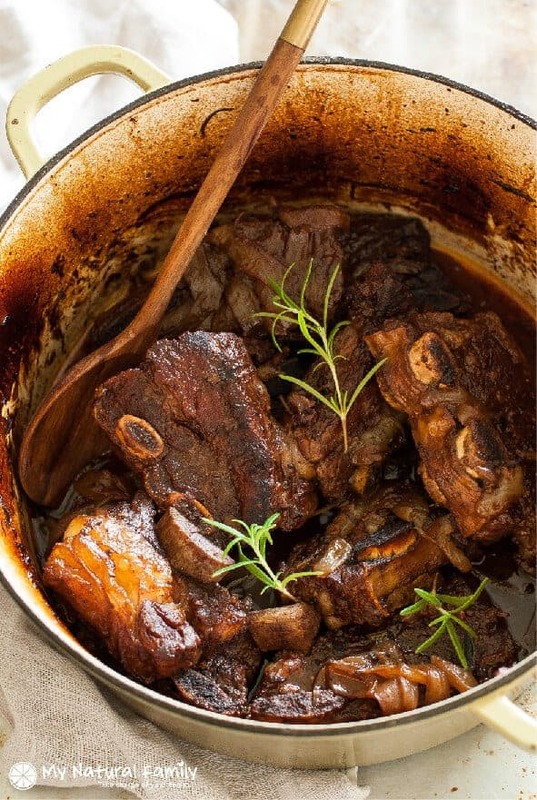 This is a Clean Eating Short Ribs in Oven Recipe with Garlic and Rosemary. It’s really easy to make these short ribs partly because there are only seven ingredients. This Paleo short ribs recipe is one I tried to copycat from a restaurant I went to. I’d never had short ribs before and I fell in love with them. Have you seen short ribs in the store and didn’t know how to make short ribs? I don’t know what took me so long to get on board with short ribs, but I had them for the first time at Disneyland earlier this year at La Brea Bakery Cafe in Downtown Disney. They were so good. I went back a few days later and had more. I had to come home and re-invent the short ribs recipe. I don’t know how many times I saw short ribs in the grocery store before I decided to give them a try. I don’t think about BBQ ribs and I thought they were basically the same thing. Wrong. This recipe makes the ribs taste like a really good roast, but I like the texture of the meat better and it has a richer flavor. The extra flavor comes from the bone, the fat, the location of the meat on the cow and this technique. Browning the ribs then cooking them in a crockpot for several hours makes tender, fall-off-the-bone ribs you can sometimes eat with a spoon. So good and so easy. I like to get this started while my children are all still at school and it’s quiet and I can turn on my favorite TV show or movie and watch while I get the ribs ready. Then they just cook away and smell insanely awesome while we do homework, clean the kitchen, do laundry, drop them off places, read to them, etc. Then when we are done with all that stuff, I normally make a side dish by throwing a bag of cauliflower from Costco in one of my Instant Pots and cooking it for 10 minutes, then I mash it with my fork and put a good amount of butter on it. So good and so easy. Alternately, you could make polenta. It’s more traditional and looks so pretty with it, but it can be difficult to make polenta Clean (especially to buy it Clean) and my children don’t really like polenta. It must be the texture. They love mashed cauliflower though. This short ribs recipe uses red wine, but beef broth can also be used in its place if you don’t want to use wine. If you do not have a dutch oven, the first step of browning the ingredients can be done in a regular saute pan and it can be transferred to a crockpot to finish cooking (on low for 6-8 hours). This recipe is a great addition to our Sunday meals list. We can prepare it before leaving for church and let it cook while we are gone and then have a great meal after church as a family. I always remember having great Sunday dinners with my family growing up. We would eat together as a family every night but Sunday’s we would have a little bit more of a nicer meal. This meal reminds me of something we would have for a special dinner. These ribs would be perfect served over polenta (as pictured) or a parsnip or cauliflower puree. Also, note that some people do not consider red wine to be Paleo. If that is you, substitute with beef broth. Please let me know if you try this short ribs in oven recipe. I would love to know how it turns out for you and if you have any questions! I have a whole bunch more clean eating recipes that I make for dinner all of the time. These short ribs are fall off the bone tender and hardly any work. Perfect for a fancy weekend dinner. Coat the short ribs in coarse salt and pepper and place in the hot pan. Cook until deep golden brown and then flip each piece over and brown on the other side. Remove the ribs from the pan to a plate. Add the onion to the hot pan and saute until onion is translucent, 4-5 minutes. Add the red wine, if using, and let it reduce by one half. Add the beef broth and bring to a simmer. If you are not using the wine, simply add in the beef broth and bring to a simmer. Put the short ribs back in the pan. Toss in the rosemary sprigs, cover with a lid, and place in the preheated oven. Bake for 2 to 2 1/2 hours, or until ribs are fall off the bone tender. Serve over polenta or a vegetable puree, such as parsnips or cauliflower. Here are 9 Paleo short ribs recipes that will melt in your mouth. Did you know that short ribs are not the same as spare ribs? I never really thought much about it or cared until I went to La Brea Bakery Cafe in Downtown Disney. I ordered the short ribs and I’ve never been the same since. They were so good, I actually went there again just so I could have the short ribs. Actually, I think I may have gone there three times in three days. I would have gone again but my kids and mother, who were with me refused to go to the same restaurant again. I kind of just always assumed that ribs were ribs. I didn’t really care that much because we hardly ever ate them anyway. When we did they were always barbecued. Well, I learned that spare ribs are pork. My dumb! Short ribs are beef. Spare ribs in pork are the equivalent of short ribs in beef. Beef short ribs are usually meatier and larger than pork spare ribs. After we left Disneyland and went home, I couldn’t stop thinking about those short ribs. I wanted them again, but I knew that wouldn’t be possible for a long time. We live 12 hours away from Disneyland. They probably weren’t Paleo either. They weren’t barbecued either they were covered with a wonderful sauce. I decided that I was smart enough to try and duplicate as closely as possible those short ribs at home but make them Paleo. What I came up with is the short ribs recipe just below that is #1. All of the other recipes here are other peoples favorite short ribs recipes. They deserve your attention also. I suggest you look them over and try the one that best suits your needs and tastes. You already know which one is my favorite though. Have I been back to Disneyland since then? That was about 4 years ago and the answer is regretful, No. It’s just not in the budget. They keep raising their ticket prices. I don’t know if it will ever be in the budget again. But see all the good that came out of that trip? I have all these short ribs recipes to share with you. This Chimichurri sauce will spice up your braised short ribs just fine. Chimichurri sauce is the best in my opinion. It helps make short ribs both easy and fancy. This is a great meal for guests or just your family. It’s a lot less work than you think it does. Prepare a pure spicy rub and rub it on some beef short ribs. Add some green onions, thyme, garlic, and butter. Put it in the slow cooker and let the slow cooker do all the work. About six hours later you will have some nice tender ribs with incredible flavor that almost falls off the bones. This Beef short rib recipe takes a little planning ahead, (you can actually make this a day or two before you want to serve it). Not more work, just more planning. That’s why it’s good for entertaining, you don’t have to cook as much the day of the event. These short ribs are so tender and delicious especially when served over the dreamy creamy parsnips, recipe included. Ness re-created some short ribs her and her husband had at a restaurant in Australia but changed it up a bit and made it Paleo. The result is mouthwatering short ribs. What I like about this is that Ness has a link to her own homemade Worcestershire sauce recipe. Worcestershire sauce isn’t Paleo. But now you can make your own and use it in any recipe you’d like. If you want to make short ribs that you don’t have to brown first or make a complicated sauce or keep checking on them. This is the recipe for you. You can put them in the oven and forget about them. They are made with non-sweet marinade, slowly baked the oven and ready to eat three hours later. Since you rub the spices into the meat, in the beginning, these short ribs are packed with flavor. Then you cover the ribs with a tomato sauce that’s made with dates, balsamic vinegar, and garlic and then you let the crock pot do its magic. The best part is that it’s sweetened with dates instead of sugar. 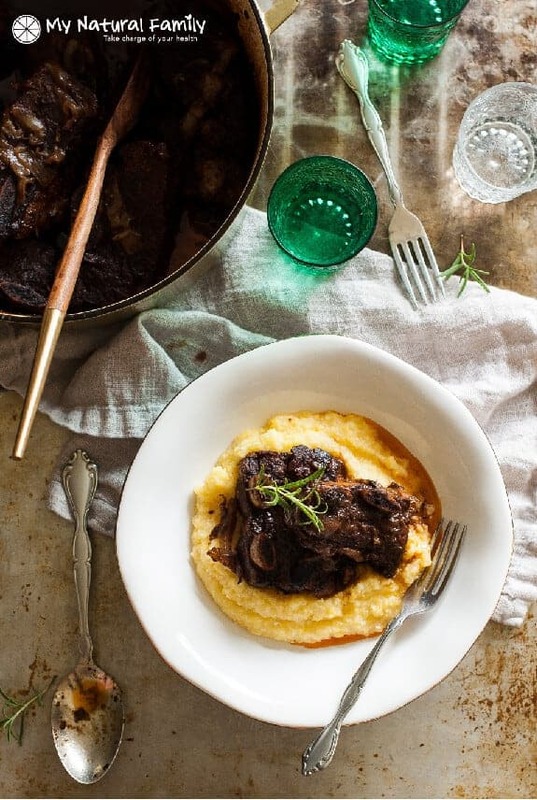 These balsamic short ribs and tender and so comforting. The balsamic vinegar and rosemary give them a great flavor. They are best when served over parsnip puree, (instructions included) and a vegetable side dish. Try some sauteed kale for a change. You’ll be happily surprised by how delicious and easy they are. A lot of short ribs recipes are made with alcohol but not this one. I like how they are cooked in a dutch oven, in the oven. I love my dutch oven and I try to use it whenever I can. Do you know what sets these apart from all other short rib recipes? It’s the cauliflower mash. Instructions are included. Thanks for this comment. I’m sure it will help encourage lots of people! I made this over the weekend per the recipe and it was delicious. I served it with a cauliflower rice side. Put the leftovers in the fridge overnight, skimmed the fat off the top in the morning, then took the leftovers from both dishes, added some additional veggies, some beef broth, a splash of chicken stock and some water to make a fabulous, delicious soup! Thank you! Sounds wonderful. Thanks for the suggestions too! This recipe looks good. But if you serve it over polenta, it definitely will not be Paleo then! Sooo good! I will make this again. I’m so glad you like it! It’s one of my favorites too and I feel like short ribs get the “short” end of the stick sometimes, which is too bad cause they are awesome! I’ve made asian shor ribs inthe past and brased short ribs. This recipe looks simple and looks delicious! I will definatly be making them this week. I have all the ingrefiants already. Can’t wait! I made this tonight and I ran into a few problems so I decided to write here to let people know how to fix them if they happen to run into the same. My rosemary is right from the garden and is incredibly sticky like pine needles. Because of this the 4 sprigs was too much- and that’s considering that I made double what the recipe called for in meat and only used an extra 2 sprigs of rosemary- for someone buying from the store or whose rosemary is not as strong as mine this likely would not be an issue. The rosemary made it bitter because of how overpowering my bush is. This is easily fixed with fat or salt. Both fat and salt balance bitter. I opted for salted butter. I’m not sure how paleo butter is considered but it fixed the problem instantly and saved the night for us. I also wanted mine a hint less sweet from the tomato paste so I slowly add’d in a squeeze of lemon until it was the balance I like. Nobody else minded the sweetness here but they all liked the taste after the lemon (you could not taste lemon you really add in only tiny amounts to taste)- this is just me nit picking but wasn’t really a problem, it could have gone without the lemon if I didn’t have it on hand it it would have been an enjoyable meal. I made sure to simmer the sauce until the flavors were well combined because this was the first time I made this and that’s how I determined what I wanted to adjust before putting it in the oven, so I recommend others do so to account for personal preference as well. After adjusting to taste as far as the flavors in the base recipe I threw in two bay leaves and about a teaspoon of dried thyme. Overall I liked this recipe and its not the OP’s fault my rosemary was way too strong, lol I just thought I would mention it. I am going to make this again regardless. This looks real good, I’ll have to try it real soon. Can you make this in the crockpot? This recipe looks delicious! You could. It wouldn’t be the same, but it would still be good. If I had to guess, I would say 6-8 hours on low. Could i do this in a cast iron ( not enameled) dutch oven? Ive heard rumors of tomato products and cast iron not working well together. I wouldn’t. Tomato definitely ruins mine, although if it’s seasoned really well, you can get away with it. Some people line theirs with tin foil or just buy one of the expensive pans. That’s my least favorite part of cast iron pans. How much tomato paste is needed? It’s listed in instructions, but not in list of ingredients. 2 Tablespoons of tomato paste. I like to buy the little squeeze tubes and use only what I need.